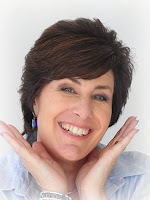 Having just signed off on the final draft of my book, Stylish Leather Jewelry, I thought it would be a great time to share a leather jewellery project that you can wear not only at Christmas but throughout the winter months. They would be a great match for the necklace design in my recent post on craftideas.com which uses Realeather Metallic Leather Trim. This leather is really shimmery so it catches the light and it adds an interesting layer of texture to the design. Cut two 1" circles with a circle die and die cutting machine if you have them or punch a 1" circle in a scrap of cardboard and use this as a template to trace onto the back of the leather and then cut out the circles with scissors. 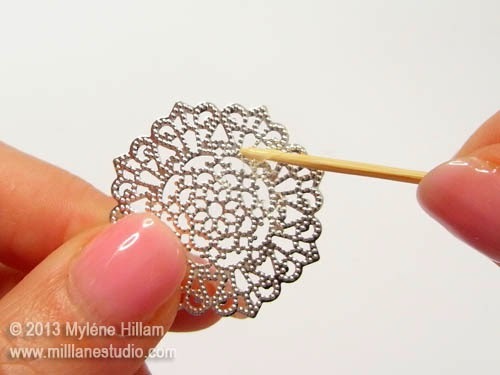 Use the toothpick to apply a thin layer of Beacon 527 adhesive to within 3mm (1/16") of the edge of the filigree. 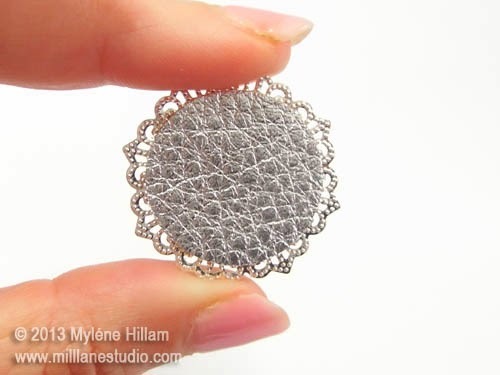 Position one of the leather circles in the centre of the filigree. 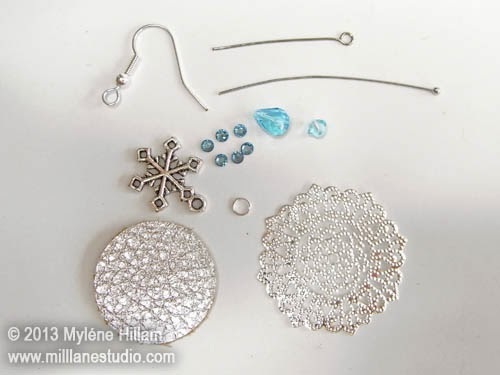 Trim away the loop of the snowflake charm with the button shank removers. Remove the excess first and then do a final trim with flush cutters. and then centre it on the leather. 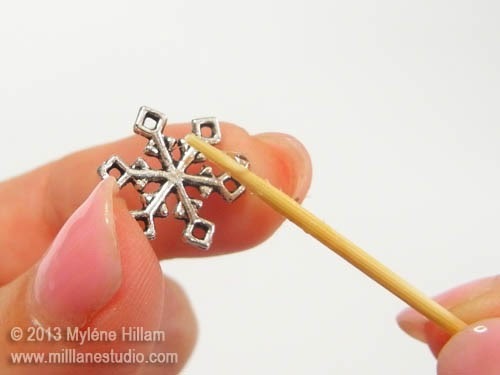 Apply the Embellie Gellie to the applicator and use it to pick up a crystal . 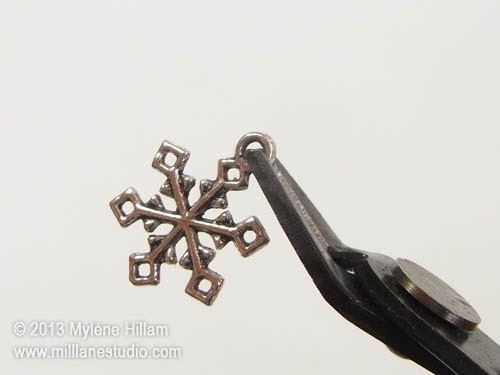 Apply a small dab of the Crystal Glue Pen to the back of the crystal and then place it half way between the snowflake charm and the edge of the leather. You may need to use a second tooth pick to help release the crystal from the Embellie Gellie . 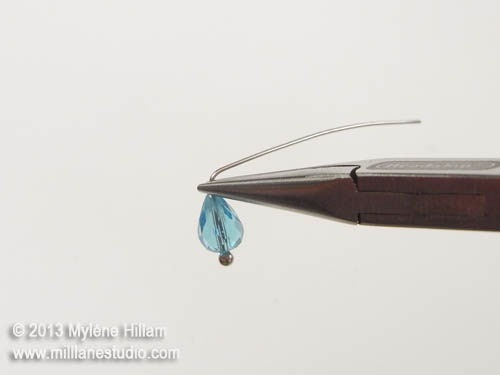 Tip: The Crystal Glue Pen has a tendency to "ooze" a bit so store it in a vertical position with the tip pointing upwards to restrict the flow of adhesive. Space six crystals evenly around the snowflake. 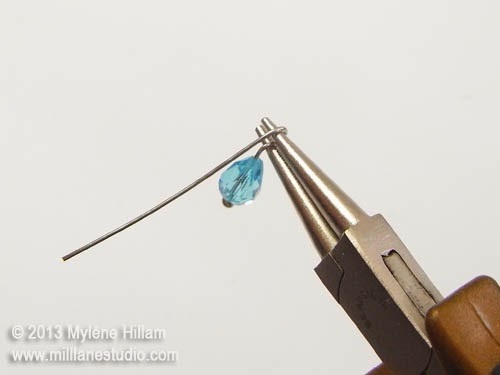 String the turquoise teardrop on the head pin and grip the wire above the bead with the chain nose pliers. Bend it at a 90° angle. Place the round nose pliers in the bend just created and wrap the head pin around the jaws to create a loop. Wrap the tail of the wire neatly around the neck and then trim away the excess wire. 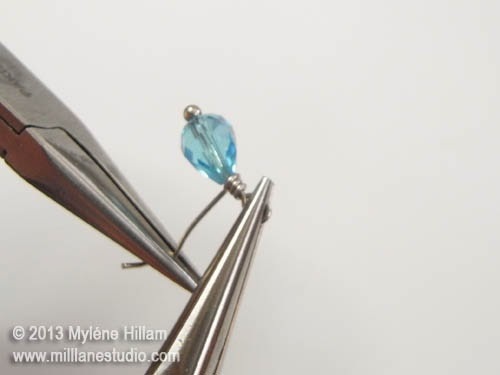 String the turquoise bicone onto the eye pin and turn a simple loop. 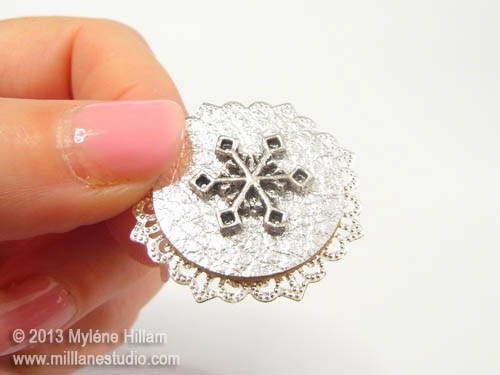 Open the loop and attach it through one of the scallops of the filigree. 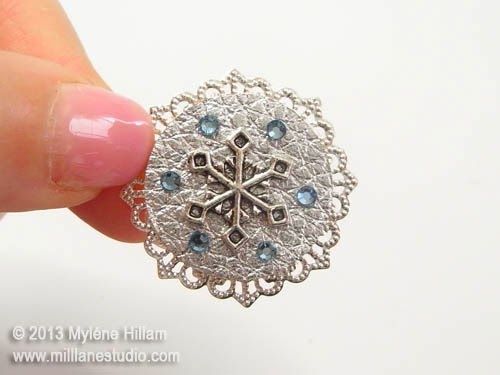 Open the jump ring, hook on the teardrop and hook it through the opposite side of the filigree. 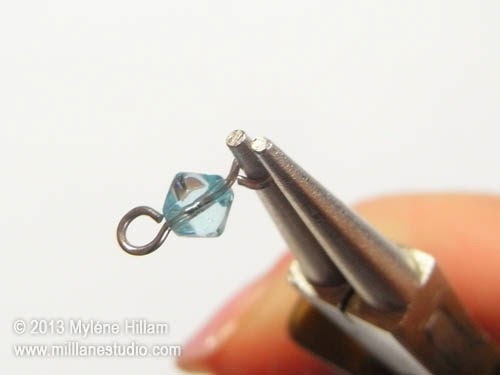 Attach the earring wire to the turquoise bicone and then make a second earring to match. I can't wait to share more leather jewellery designs with you later on, but in the meantime, you can see some more of my leather jewellery on Pinterest. I hope you'll check it out. 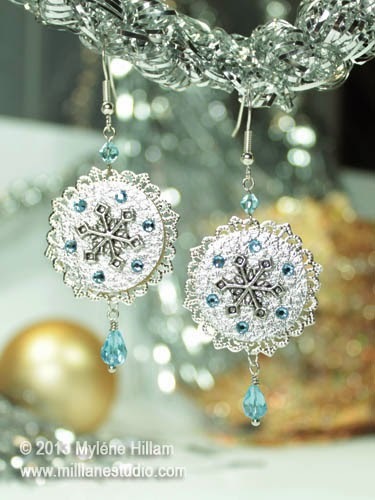 And if you love these Christmas Snowflake earrings, then check out my 12 Days of Christmas Earrings ebooks for even more holiday earring inspiration. Each volume has twelve original and festive designs to choose from and you can download your purchase immediately after checkout.